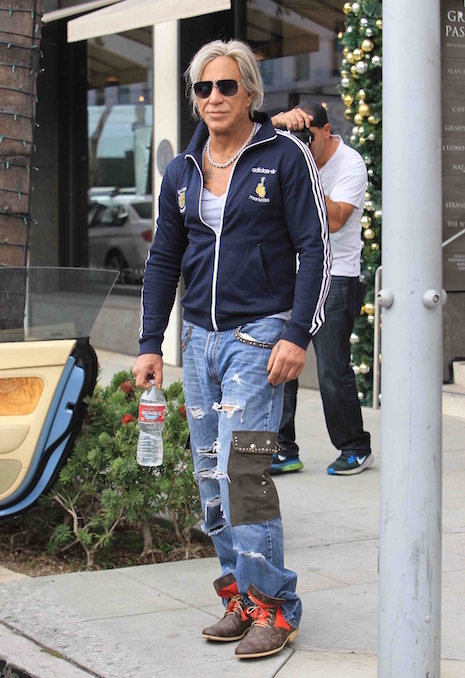 He’s no beauty, but Mickey Rourke remains one of the most intriguing actors around. He’s changed his looks more than any Hollywood actress we know, but he gets away with it. And his fashion choices are never boring. But one of Mickey’s longtime and BEST friends is a hair stylist – they see each other frequently. Why doesn’t Mickey’s stylist pal step in and help Mickey with his HAIR? He has an assortment of unnatural looking wigs that desperately need attention. Regardless, Mickey has several movies in the works – some horror, and even a romantic comedy. Devolve would be a better word. He swings both ways doesn’t he? Isn’t that the rumor? Isn’t he some guy’s boyfriend ? He doesn’t even resemble the Rourke from the 80’s. When did Mickey start looking like Fred Armisen?